A dying 37-year-old father had a final wish: to take his 6-year-old daughter to the snow. That is not an easy request to grant in Southern California. 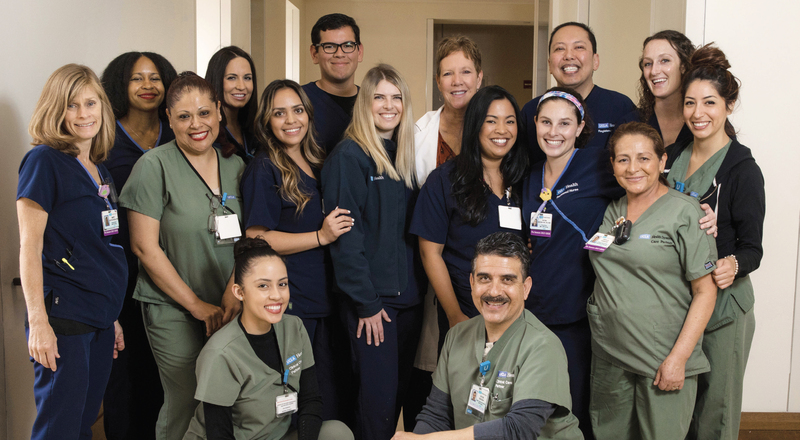 With teamwork, determination and the generous support of UCLA, Santa Monica, a group of dedicated oncology nurses made it happen. Remarkably, in three short days, Snow Day was planned, and it was perfect. Elvis had endured two years of treatment, as well as a tandem stem cell transplant and moving his family to Los Angeles. His significant other, Leah, and daughter, London, were always at his side, caring, supporting and loving him. A cure was not to be, and Elvis relapsed less than a month after his stem cell transplant. Heartbroken but determined to live for his daughter, he endured several more months of chemotherapy, with little response. One week before Christmas, Elvis was admitted to the oncology unit, where he was loved by all. It was tough to gain Elvis’ trust early in this treatment — he was diagnosed while intubated in the intensive care unit — but his love for Hot Tamales opened the door, and the staff always ensured that the candy was on hand. It was clear that time was short. London was a bright star for her father and all around her. Elvis held the hand of one of his dedicated nurse healers and said, “I want to take London to the snow.” As word spread about this dying wish, the compassion and need to go above and beyond took on a life of its own. Oncology nurses started calling, emailing and texting, and Snow Day was born. Hospital administration donated money for 15 tons of snow, and everyone on staff chipped in for tickets to Disney On Ice for London and her aunt. Snow gloves were purchased, Queen Elsa was found (the friend of a nurse’s daughter), and many nurses and care partners purchased “snow stuff.” Oncology nurses asked, “What can I do? Do you need more money? And can we all come?” Nurses put their own holiday plans on hold to make this event possible. Night nurses and care partners set their alarms and dragged themselves out of bed after a few hours of sleep to witness this remarkable day. The day shift was staffed up to allow nurses to rotate to the party. 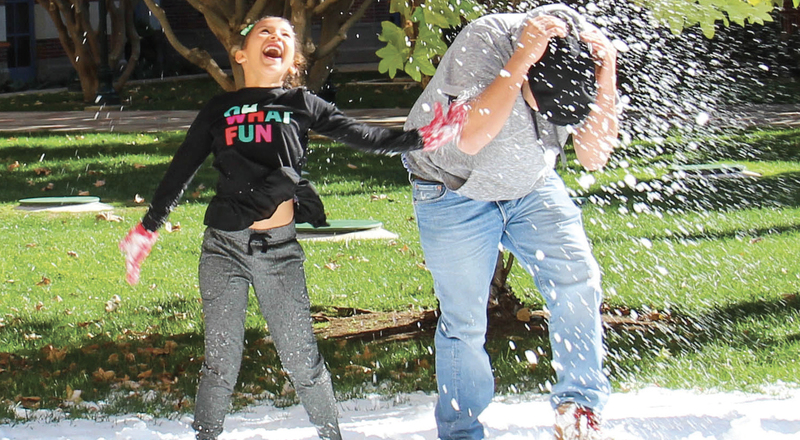 Staff members came with their children and dogs, and many from the hospital showed up to experience this incredible event: snow in Southern California. The attending physician paused rounds, and the entire team came to the party. One nurse too busy to attend took her break later in the day, and she and London enjoyed an hour playing in the snow. London could not get enough time in the snow. Respiratory therapy was necessary, as the patient was on high-flow oxygen. The therapists planned and practiced how to get Elvis outside for several hours, everyone going above and beyond their workday. Queen Elsa arrived at the patient’s room, and London was speechless: This was her dream come true. Family members changed Elvis into his Santa suit and placed him in the wheelchair, which was followed by respiratory staff members with carts of oxygen tanks. Snow Day reinforced for all the oncology nurses that our work is messy, difficult and the most remarkable nursing that one can do. Our hearts were joyful as we watched London and Elvis playing in the snow. None of us will ever forget the day that oncology nurses once again made an amazing difference. Elvis died on Christmas morning, Leah at his side and London at home with family, waiting for Santa. We hope that we made a precious memory during an awful time in this little girl’s life.